If you read my SunSense post back in March (post here) you'll know that this year I'm on a mission to find a sun protection cream that I'm happy to wear under makeup. Although I would be happy to use one of the SunSense products that I tried out under makeup the only issue with this was that it took a little while to sink in. So it wasn't ideal for if you're in a bit of a hurry or want extra time in bed in the morning so have less time to apply your makeup. 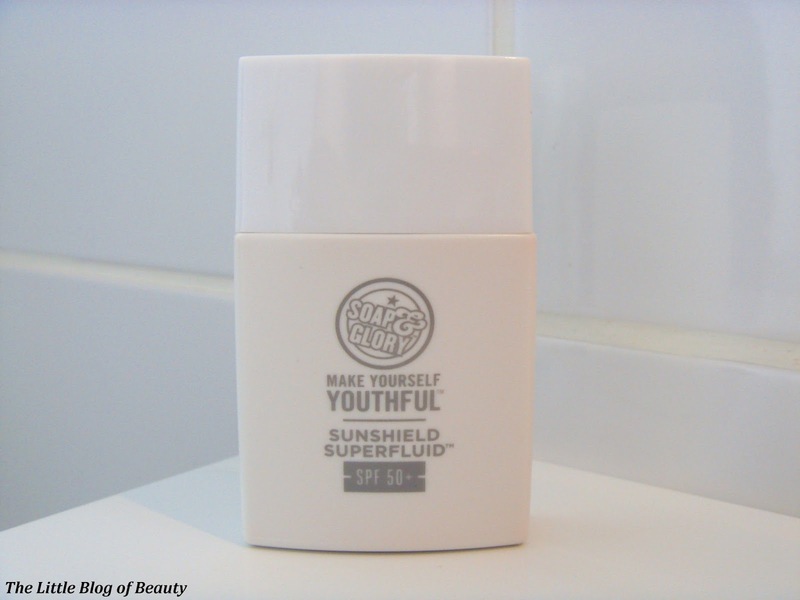 After spotting a couple of posts about it I decided to try out Soap & Glory's Make Yourself Youthful sunshield superfluid SPF 50+ (wow, what a mouthful!). At the time I decided to buy this it had £5 off at Boots but the day I actually bought it the offer had finished the day before, boo! Luckily though I did have a Boots voucher for 300 extra Advantage card points on any Soap & Glory skincare purchase, so that softened the blow a little. Boots have obviously noticed what a Soap & Glory fan I'm becoming as I currently have three different extra points coupons for the brand (which have all actually expired since I wrote this post)! I know that Soap & Glory have recently redesigned the packaging on their facial skincare range so it's not as quirky as the packaging on their bath and body and makeup ranges, but I have to say I'm a little disappointed with the packaging on this product. The outer packaging is fine, I like the simple clean look with the slightly reflective silver, but the actual bottle is very dull with quite cheap looking white plastic and slightly muted looking grey writing. But packaging aside, it's what's inside that counts. 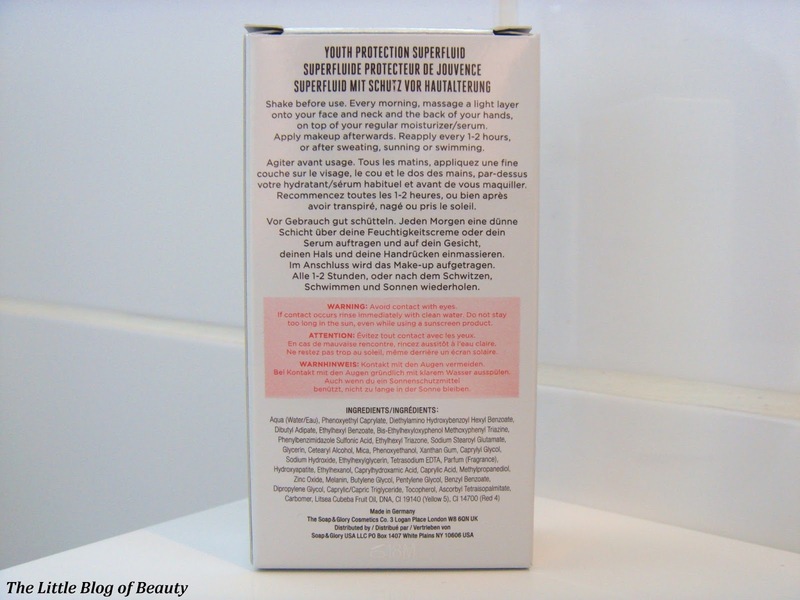 This contains SPR 50+ with both UVA and UVB protection. It's anti-aging and for all skin types. It contains Vitamin C and E and what Soap & Glory have called Suntrigger smartspheres and Instamatte oil control, don't you just love the kind of scientific sounding names they come up with! If you want to know exactly what any of these mean they do explain what they are over on their website. As you can probably see this is quite a tiddly little bottle and it does contain just 30ml of product. However, unlike most sun protection products you aren't supposed to use a lot of this. This does confuse me slightly because as I just said with most sun protection products you are supposed to slap a load on and if you use less then directed then you may have a lower level of protection. But I trust Soap & Glory and the directions say to apply a light layer. 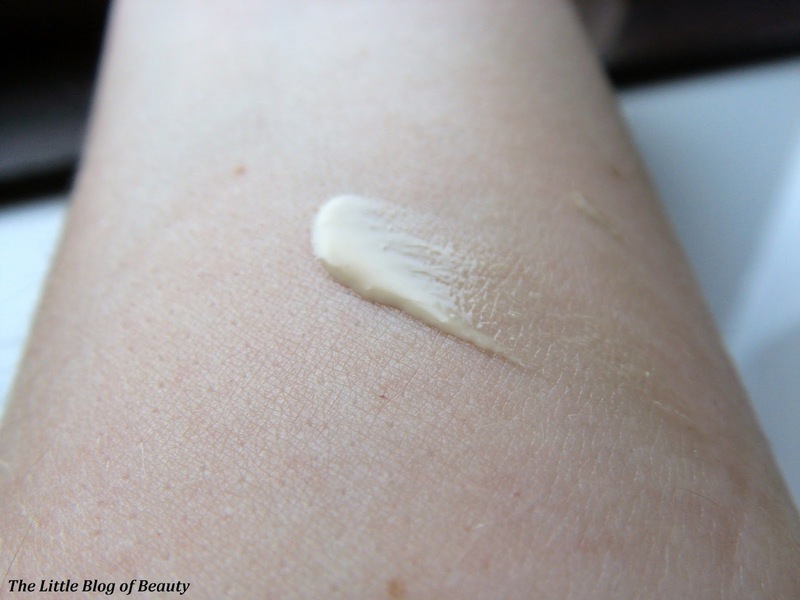 This has a thin consistency and does look like it's slightly tinted but it doesn't provide any level of coverage. I like that the bottle has such a small precise nozzle which is definitely needed to try and keep control over how much of the thin fluid is dispensed. 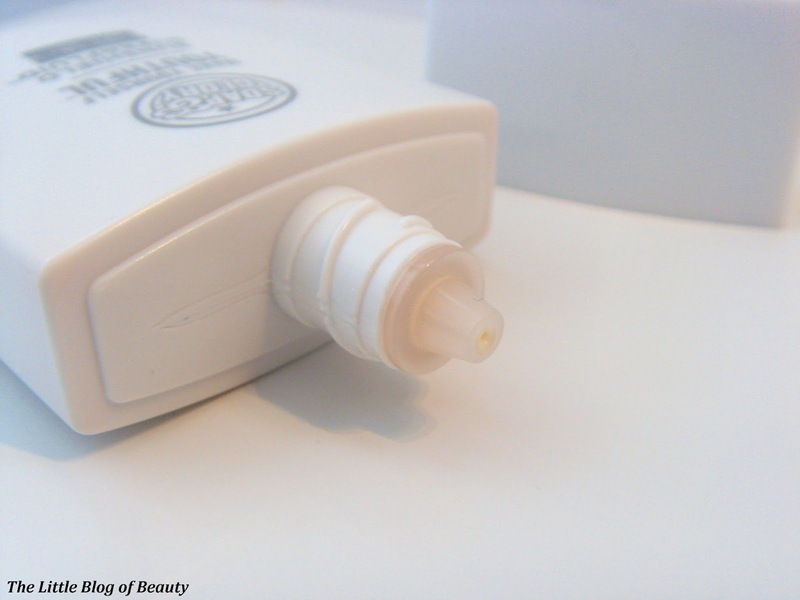 The bottle should be shaken before application and a light layer massaged over the top of serum and/or moisturiser on the face and neck (and the backs of your hands too if you wish). It does say this should be reapplied every 1-2 hours or after sweating, swimming or sunbathing, but obviously you wouldn't be able to do this over makeup. This does absorb very quickly and doesn't leave any kind of oily feeling (or white cast) behind so once applied you can pretty much go straight on to applying your makeup, although it's probably best to give it a couple of minutes to settle. Once you've got makeup over the top of this I don't find that it affects it in anyway. I have dry skin but my chin does become oily once makeup has been applied over it and I didn't find that it made my chin anymore oily than normal. At £15 I don't think that's too bad a price, it is only small but you only have to use a small amount. This is perfect to apply under makeup so I think I've found my daily facial sun protection. 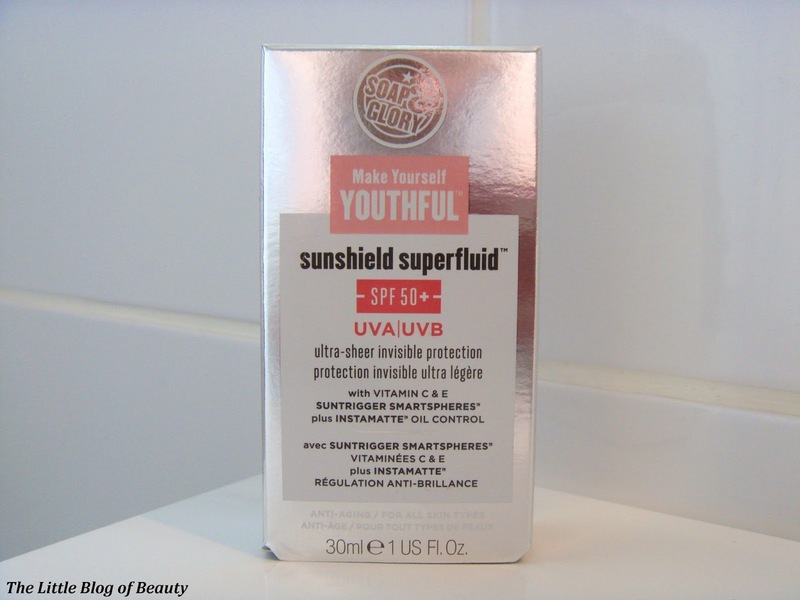 Do you use facial sun protection? This looks cool! I also need some thing like this to go under make up as sun cream can be a bit oily. I'll have to give it a go!